“Chocovado”: a vegan chocolate mousse with avocado. The December holidays have been over long enough ago for me to dare post an amazing dessert recipe to seduce you all back to sweetness and sinnery. This dessert is so simple yet soooooo tasty! 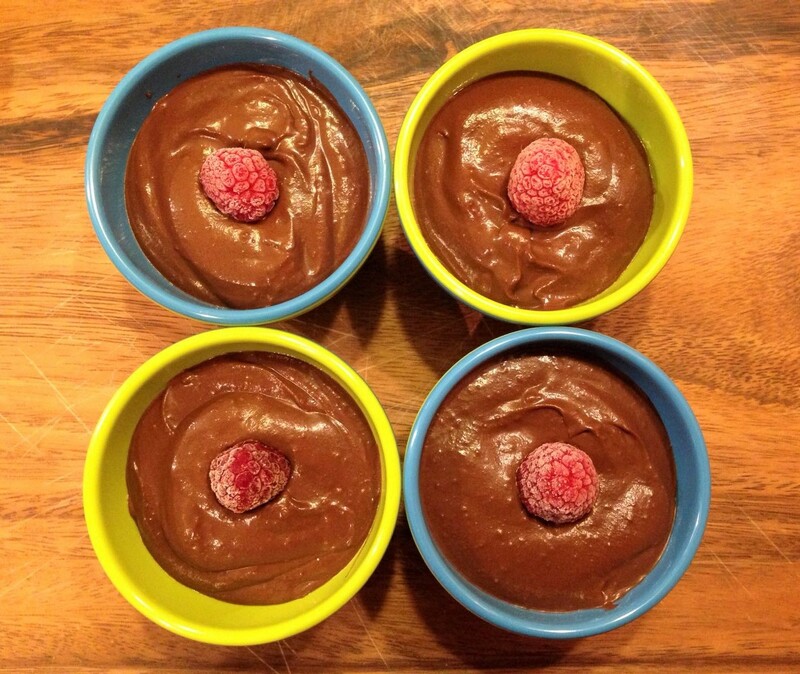 And very healthy too, because it’s an avocado-based vegan chocolate mousse! Normally I don’t care much for desserts, let alone chocolate-based desserts, because I usually enjoy my main course so much that leaving space for dessert is futile. Especially rich cholate-y desserts, that are often quite filling are a waste on me. Recently, however, I heard that vegan chocolate mousses are often more easy to digest. That got me interested! Also, I was curious whether it would be tasty enough to make me scoop up a little less, to leave room for a yummy dessert. And now, I’m a fan! This mousse tastes sooooo creamy. Even without any milk, cream or eggs! So if you’re expecting guests, or just want to spoil yourself with a luxurious dessert, this is it! Peel the avocado and put it in the bowl of a food processor or a large measuring can (if you use a hand-held blender). Melt the chocolate in a bowl in a pan boiling water (au-bain-marie) and let it cool down a few minutes. Then, add all the other ingredients to the bowl and mix for a few seconds. After that, sweep the sides of the bowl carefully and mix everything again for a few seconds. Lastly, add the melted chocolate and mix everything until it is really smooth. NB: these amounts make 4 tiny dessert bowls, so keep that in mind. In my opinion these portions are just right, but if you’re in the mood for a larger dessert, you can easily double the amounts!